A 6th witness has this morning been presented to pin Pine car bond proprietor Muhammad Ssebuwufu over murder. 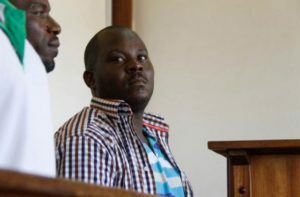 Prosecution led by Micheal Ojok presented police doctor Emmanuel Nuwamanya before the High Court, who testified that he examined Ssebuwufu and his co-suspects and found them to be of sound mental status and having no fresh physical injuries . Nuwamanya told presiding Judge Flavia Ssenoga Anglin that he carried out a medical examination on Ssebuufu on October 26, 2015, at Nsambya Police Barracks upon receiving a request from Kampala Central Police Station. Other suspects that Dr Nuwamanya examined are Phillip Mirembe, Godfrey Kayiza, Paul Tasingika and Steven Lwanga, who all had no physical injuries and were also in normal mental status . Ssebuwufu and seven others are facing trial for murdering businesswoman Donah Betty Katusabe, who, it is reported had failed to pay a Shs9 million debt which was balance of a car she purchased from Ssebuwufu’s bond at Lumumba Avenue in Kampala. Amon Twesigye a legal assistant at Tumwebaze Atugoza and Kobusingye Advocates last week testified that he also escaped the wrath of Ssebuufu on the fateful day businesswoman Donah Betty Katusabe was murdered. Twesigye told court that he had gone to rescue Katusabe who was a client at their law firm when he found her locked in a room at Pine car bond. He further testified that on arrival,the accused, led by Ssebuufu were kicking her on the breasts and private parts.